In 1539 King Henry VIII granted the manor of Pichesey (Pitsea as know known) to his 1st minister Thomas lord Cromwell. This has paved the way to the beautiful Cromwell manor as we know today, set among 8 acres of manicured gardens. 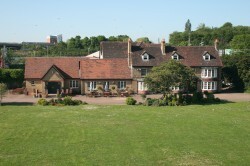 We have a fully equipped bar and disco floor, along with function rooms making Cromwell manor a truly versatile place. Or our marquee could offer a perfect prom alternative Call our dedicated prom team today and allow us to make your prom a day to remember.